I haven't been to Gian & Piero's bakery in quite some time and decided to stop by yesterday to satisfy my craving for fresh, crusty bread. Wow, did this place deliver! I got a huge loaf of their signature, Pane di Casa, which made quite the impression on my family and me. The loaf was so tasty, that a trek to this Italian haven is in my near future. 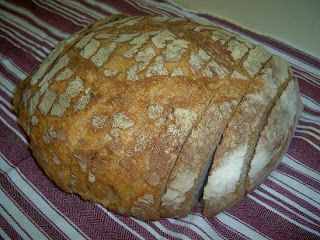 Pane di Casa - Aside from the amazing, fresh taste of this bread, its appearance is absolutely stunning. The picture above shows a cut up version, but know that it's even prettier untouched. Its blistery crust is an accurate preview for the deliciousness that awaits inside. Once you cut this baby and slather it with your favorite spread--be it butter, hummus, pesto, whatever--your tastebuds instantly experience pleasure. The crust is wonderfully crispy and the interior is soft with a slight hint of sourdough. The consistency of the bread is light, with plenty of airy pockets from all the little holes. Whether eating this bread with something savory or sweet, it brings out the best in each accompanying ingredient. Price - This generously sized round of goodness comes at a modest price of $3.